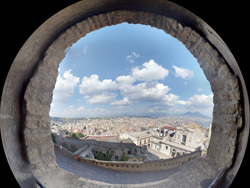 Lean Italian in Naples and discover a city drenched in art, history and culture. Located on the Mediterranean coast, in the Campania region of Italy, Naples has been represented throughout history by poets, artists, philosophers and musicians, leaving the city with a legacy of historic architecture and culture and a charming old town that is listed by UNESCO as a World Heritage Site. Naples itself is a fascinating city and can also be used as a base to explore the beautiful Amalfi Coast. Famous attractions such as the Isle of Capri, the ruins at Pompeii and Herculaneum, Sorrento and Positano are all close by! 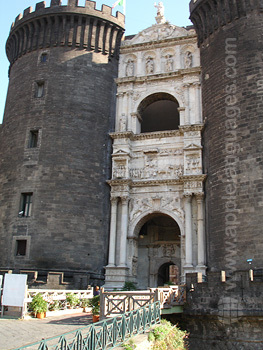 Our Italian language school in Naples is located in a 17th century building, in the historic centre of the city. There are 9 well-equipped and air-conditioned classrooms and library/study room. Free Wi-Fi access is available througout the school building. 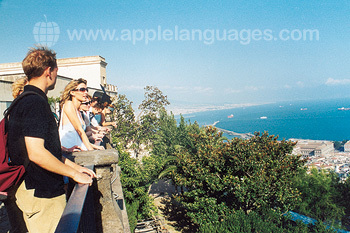 You can learn Italian on an Intensive Italian language course of 20 lessons per week or, if you want to learn as much Italian as possible during your course in Naples, an Intensive + Private Lessons course is the perfect choice for you! Italian food fanatics can benefit from an Intensive + Neapolitan Cookery course, giving you the opportunity to combine your language-learning with Italian cookery workshops. Cookery workshops are held in the evenings, and are followed by a group dinner, where you can sample the dishes you have prepared, accompanied by a glass of wine and more Italian conversation! Alternatively, take an Intensive + Homemade Fresh Pasta course where you will learn how to make one of Italy’s most popular gastronomic delights – pasta! We even offer an Intensive + Classical Singing course, giving you the chance to practise singing with full instruction from a professional teacher. For full immersion into the Italian language and culture, we can arrange accommodation with a local host family. This type of accommodation is especially beneficial for your language-learning, as our school’s carefully-selected families speak Italian to students at all times, giving you the perfect opportunity to practise the language skills you learn in class. You can also choose to stay in a shared apartment, each consisting of 2-3 bedrooms and shared kitchen and bathroom facilities. Gain a much deeper understanding of the Italian language, history and culture at our school in Naples, which regularly offers seminars on such topics! 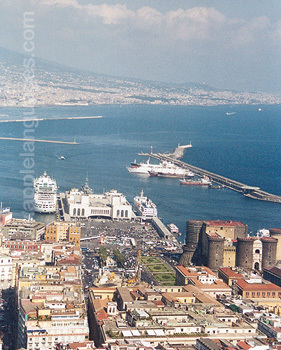 Our Italian language school in Naples can arrange airport transfers from Naples Airport at an additional cost, if you would like to be met on arrival and taken to your accommodation. Average score for our school in Naples based on 41 previous client reviews. Very Good approach between formal and conversation. Even intensive it was not hard to keep focus. Very good staff well experienced and very friendly and good mood. Congratulation to the all staff. The group was small (5 students) and motivated (mainly persons in their 40's), the teachers very professional and friendly which helped us to improve the language rapidly. The apartment was big, with a nice view and located in a great place in the center so easy to wander around the city and to be on time at the school ! Regarding the lady who hosted me, she was lovely, very helpful, generous and educated. She explained me many aspects of the Napolitan culture and the interesting places to visit. 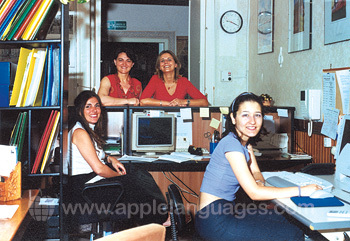 The service provided by Apple Language Courses was optimate, very professional and friendly. 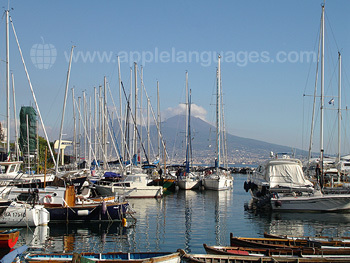 I would like to thank the staff of Apple Language Courses as well as the staff of the school and the lady who hosted me as I spent a wonderful time in Napoli. Congratulations to the school for the high standards you develop and maintain in the programme. From the first day everything I experienced was very professional, services, extra curricular offers and staff in reception etc were great. The only thing I was not clear about was the start time of the classes, as before I came I had information that it was to be 9.00 and it took me a couple of days to see that it had changed! I did the intensive course for 1 week. 5 days, 4 hours lessons. Classes of 8-10 persons, of all ages and nationalities. All students in my class were of the same level; good selection! Teacher only spoke italian during the lessons, which was good for practising. I learned al lot! Very intensive and enjoyable. I needed to learn a lot in one week and it exceeded my expectations. Good explanations of grammar and culture and plenty of opportunity to practise and talk. Great opportunity to talk Italian and eat local food. It's best thing I have ever done and the teachers are amazing!! Going back really soon!! My host family was friendly and always made sure I was okay! The teachers were excellent. They continually moved the class forward. They got to know the students and were able to use this information to advantage in the discussions in our classes. My host was very friendly and very near the school. The staff and teachers were super. My private lesson daily was the best instruction I have had. The teachers in the group class would go over things and let my afternoon teacher know of my weaknesses and she would work patiently (and I do mean patiently) with me. They were helpful with restaurants, shops, directions, and all of my other requests. I wish I could have stayed another week. The instructors put together a class comprised of people who had very similar strengths and weaknesses and concentrated on mitigating the weaknesses. I feel that I learned a good deal. The family experience was positive in that family members were very friendly. My ability to speak and comprehend improved greatly. The intensive course was great! I was upset to have to leave after only a week. Even in just that time, however, I feel that my language skills improved greatly. I would take another course like this again in a heartbeat! The accomodation was comfortable and spacious. I liked that all of the other tenants were also students - it gave us something in common! The proprietor was also very friendly and flexible. After such an all-around wonderful experience, I will definitely be enrolling again! Exactly what I wanted but with extras. With a one-to-one with my tutor for a forty hour intensive week of study I felt as if I'd been beaten up. But it felt great! Being able to dictate the pace of the week and to explore so many things without holding up a class was very, very useful. I started the week with just a basic understanding along with a few 'tourist phrases'. I finished the week with a far greater understanding of the structure of the language and an overwhelming confidence in my ability to proceed. My tutor was a true professional allowing me to explore the framework of Italian verbs and grammar at a pace which stretched me enough to learn comfortably. There's loads of stuff I'd like to add about how great the whole experience was and how good it was to learn not only the language but the history of the country and it's people and how amazingly friendly the people are... but there's just not enough room!! I thought the teachers were brilliant - really enthusiastic, caring and hard-working. The resources were all interesting and helpful and lessons were well-planned and well executed. The staff at the school reception were also very helpful and informative - helping with bus and train information and any other problems and queries. The range of after-school activities was also varied, interesting and suitable for a wide avariety of students. I would definitely recommend this school. The flat was large, clean, bright and extremely close to the school. The faciliies were excellent and I was very impressed with the building and location. I would certainly stay in the same flat again. 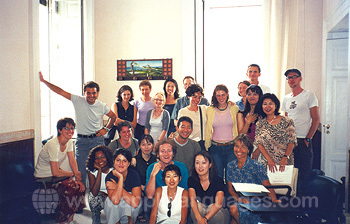 The course was brilliant I couldn't have asked for a more welcoming and organised place to study Italian. The teachers were excellent as well as the extra activities that were laid on for us. Excellent course. Good teachers, helpful, nice and very professional. My accommodation was excellent and very central. The apartment shared with Italians so was an excellent opportunity to pratice the language. Fantastico! The school has only top notch instructors who really know the language, the culture and history. Gli insenganti e le secretarie si sono il piu milgliori e molto simpatico! The same goes for the staff of Language Courses Abroad. Scott Cather was extremely friendly and helpful - he always answered my questions in a rapid manner. BRAVO! I would highly recommend this program for anyone whether beginner or advanced and wish to continue their Italian studies. The classes were small and everyone was encouraged to participate. My individual lessons were very good, they helped me to understand some Italian fundamentals that I had been struggling with for many years. The teaching and admin staff at the school were very helpful. The programme of extra activities provided by the school were very good too, giving a better understanding of Naples and Italy than provided by guide books I had read. My accomodation was ideal, a lovely modern apartment within a historic palazzo. I was able to study, cook and entertain with ease. The mix of students on the course was very good it was a pleasure to join the other students for dinner and to other outings. Very professional teachers, great course. A fantastic experience and the best way to learn a language! I only wish I could have stayed for longer. A fabulous experience. The teachers and office staff were competant, engageing and professional. I believe they did a good job of working with me at my level of Italian. The course was excellently organised and taught by two great teachers, they were very flexible when rearranging schedules to allow me to participate in excellent free cultural activities. I stayed with a charming host family, lovely clean accommodation, and boy can Theresa cook! Napoli, what a city, a real working Italian city with attitude. Noise, traffic, scooters, cafes, churches, beautiful buildings, macho men, exquisetly dressed people, beautiful women, pizza, pastries, designer shops, breathtaking views, me piace ! The teachers where great, they made the classes a lot of fun, the school was really well organized. My accommodation was great, I really enjoy the people that I got to live with. Napoli is a lot of fun there are so many things to do. I highly recommend it. 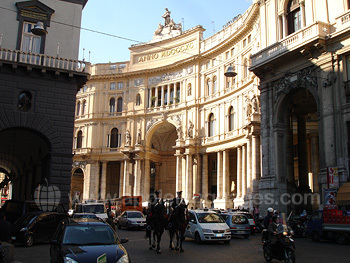 Celebrate New Year in Naples!